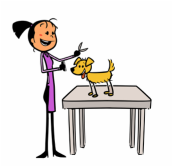 A small and personal grooming salon that provides a stress-free, comfortable, clean and safe environment for all canine companions to be pampered so they leave looking and feeling their best! It is my top priority for all of my clients to feel comfortable leaving their loved ones with me. I do my absolute best to treat each dog with the care and love they deserve. To help me achieve this, I book my appointments for a one-on-one experience. You drop off your pup at appointment time so they can get started right away, get their spa treatments, and then receive a call when they are done. They don't have to sit around and wait for hours where anxiety can build and make the experience less enjoyable. Most appointments are usually between 1-2 hours. I am also the only one handling your pup as I feel this also helps create a stronger bond. If you have any other questions or concerns about my process please feel free to call me or stop in!